The Eighteenth Judicial District Commission on Judicial Performance unanimously recommends that Judge Cheryl Rowles-Stokes BE RETAINED. 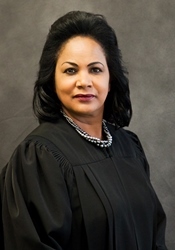 Judge Rowles-Stokes earned her undergraduate degree from Colorado Christian University and a Master’s degree from Jones International University. Additionally, Judge Rowles-Stokes matriculated to the University of Denver Sturm College of Law and earned a Juris Doctorate degree. Prior to becoming a judge, Judge Rowles-Stokes distinguished herself as a human resource professional at High Speed Access Corporation and Rifkin & Associates. Judge Rowles-Stokes is most notable for her esteemed career in the Arapahoe County District Attorney’s Office of which she served as the Chief Deputy District Attorney in the Economic Crimes Unit for eleven years. When not on the bench, Judge Rowles-Stokes dedicates a significant amount of her free time serving the community as a treasurer for the Sam Cary Bar Association and the Sam Cary Scholarship Endowment Fund. The commission conducted a personal interview with Judge Rowles-Stokes, reviewed opinions she authored, observed her in court, and reviewed surveys sent to attorneys and non-attorneys. Among the survey questions was “how strongly do you recommend that Judge Rowles-Stokes be retained in office?” Of attorneys responding to the survey, 33% recommended retaining, 51% not to retain, and 15% made no recommendation regarding retention. Of non-attorneys responding to the survey, 90% recommended retaining, 7% not to retain, and 3% made no recommendation regarding retention. (These percentages may not total 100% due to rounding). It is important to note that the sample size of attorneys who returned the survey totaled only 37 people, and the Commission finds, from a survey point of view, that the sample is too small to be useful. Judge Rowles-Stokes presides over misdemeanors and traffic matters. Based on the survey results of attorneys, Judge Rowles-Stokes received an overall combined average rating below the average combined rating of all county court judges standing for retention. Of the non-attorneys surveyed, Judge Rowles-Stokes received an overall combined rating slightly higher than the average combined rating of all county court judges standing for retention. Judge Rowles-Stokes received below average marks in case management, application of knowledge of law, communications, and demeanor from attorneys surveyed. However, among non-attorneys, Judge Rowles-Stokes received above average marks on each of the above referenced categories. Judge Rowles-Stokes was given the opportunity to explain the wide disparity between the attorney and non-attorney grades. Judge Rowles-Stokes opined that her prior position as the chief deputy district attorney, as well as the standards she places on attorneys who appear before her, might have contributed to the lower average grades from the attorneys. Judge Rowles-Stokes also offered her written opinions as evidence of her understanding of the law. Based on the totality of the information gathered, the Commission unanimously agreed that Judge Rowles-Stokes should be retained. Judge Rowles-Stokes is often described as being excellent at understanding complicated and detailed cases, and placing more thoughtful consideration into sentencing than other judges.